Victorian buildings that are still at the heart of civic Street were brought back to their former glory in 2010. The New Parish Rooms at 6 Leigh Road and The Old Police House at 8 Leigh Road were both refurbished. Leigh Road is often referred to as Street’s Civic Road, as many years ago important civic buildings designed by renowned architect George Skipper were built there. George Skipper was born to a building contractor in Norfolk in 1856 and after studying art and architecture began his architecture career in 1873. An artist at heart, he is well known for his free-style architectural approach and arts and crafts designs. However, his principal buildings were impressive enough for John Betjeman to have described him as the ‘Gaudi of Norwich’. While he may be renowned for his Norfolk-based projects – including later in his career a Royal commission at Sandringham – he became a major figure in the mid-Somerset building boom of the Victorian life period. In fact, according to Norfolk heritage website Norwich HEART, Skipper is often cited as getting his architectural break as a young architect by winning a design competition for the district hospital at Shepton Mallet. The Shepton Mallet success led to subsequent mid-Somerset commissions including the patronage of Sir Richard H Paget, a mid-Somerset MP and landowner from Cranmore, near Shepton Mallet and William S Clark, of Clark’s Shoes. Many examples of Skipper’s work remain, including several cottages at Doulting. The Clock Tower on the headquarters of Clarks, several rows of cottages including two of the Tudor and Jacobean-style blocks of houses in Wilfrid Road and a vestry are attributed to Skipper. He was commissioned to design Millfield as a private residence, now the home of Millfield School. Norwich HEART claims Skipper buildings can be really easily spotted. “A Skipper building can be recognised by some of the elements he was fond of using: emphasising corners where facades met; highlighting entrance bays with turrets, towers or full height pilasters; lively roof lines with domes; and deeply moulded facades,” it states. A Short History of The Vestry Rooms, Leigh Road, Street (courtesy of Richard Clark). The first purpose made Vestry Rooms in Street were built in 1860 by Thomas Petvin on the site of the vilage pound on the corner of High Street and Pound Lane, now called Vestry Road. In 1882 William Stephens Clark purchased land in Leigh Road. He built Crispin Hall in 1885 and planned that Leigh Road should have municipal buildings between the High Street and Hindhayes. He gave the land for the Vestry Rooms to the parish in 1887. This was followed by the Methodist Church in 1893, the Technical School in 1899, the secondary school in 1913, the Maxime Cinema in 1920 and Street Library in 1924. 1887 was the year of Queen Victoria’s Golden Jubilee. The two public buildings – the Clock Tower on Clarks building as the firm’s contribution and the Vestry Room in Leigh Road as the community contribution were commissioned. The new vestry rooms were built by the Vestry of the parish of Street in 1887. The vestry (meeting) room was upstairs with rooms for the fire engine and hearse downstairs. Part of the premises also included a three bedroom house with a well outside for water. In 1894 the Vestry became Street Urban District Council. In 1967 it moved into the former Technical school on Leigh Road. The Vestry rooms were owned by C & J Clark who used it as offices, then rented it out and sold the freehold. Clark incorporated part of the land at the rear into access for the Crispin Centre and for Tesco vehicles. 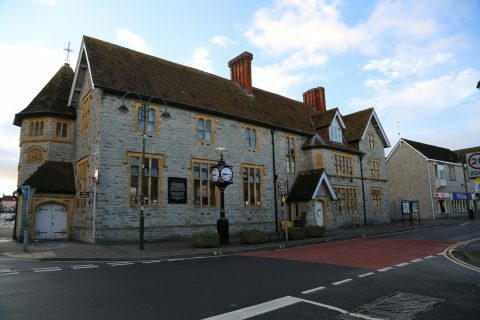 The old Technical School was used by Street Urban District Council up to 1974 when under local government reorganisation the premises became owned and used by Mendip District Council. Built in 1885 by George Skipper of Norwich, Crispin Hall was built for William S Clark. It was originally used as a public hall, library and reading room. A small museum opened in 1887 which housed a fossil collection, many of which were found in quarries in Street. The museum closed in 1948 and the artefacts are now housed in the National History Museum in London. Today Crispin Hall houses a cafe, haberdashery, uniform shop and antique jewellery. A weekly market is also held there. 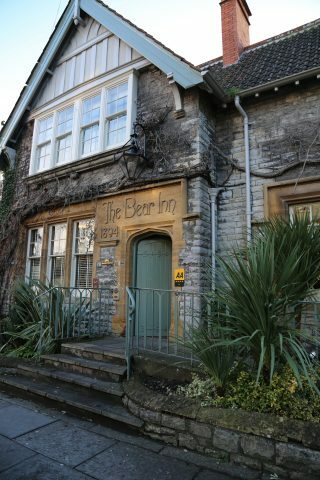 This building was owned by the Glastonbury Abbey Estate until 1539 and was then used as a gentlemen’s house. In 1890 it was taken over by Clarks, used as a hostel for young women and then as a training centre for Clarks’ management students. Built in 1859, it was taken over by Somerset County Council in 1903 and then closed down in 1973. It is now used as a furniture retail shop and is situated on the High Street on the corner of Orchard Road. This building was built in 1850. The Society of Friends (Quakers) have been an important part of Street and the community for three centuries. The church is situated on Church Road opposite Strode College and was built between 1300 and 1460. It is possible that it stands on the site of a Roman Villa. The museum is housed in the oldest part of the C and J Clarks Headquarters building in the High Street. It displays the history of shoemaking from Roman times to the present day. This was built in 1894 as a temperance hotel and did not have a license to serve alcohol until the 1970’s. It was built on the site of ‘Godfreys’, the public house whose license had been cancelled in 1883. It was designed by William Reynolds. Bancroft Clark commissioned the building of Greenbank Pool after his aunt, Alice Clark, left money in her will to provide a pool which would make swimming facilities available particularly to women and girls who were excluded from bathing in the local River Brue where the men bathed naked. It is seen as the only example of the ‘Modern Movement’ in Street as it is built from reinforced concrete and rendered blockwork, all painted white. Its official opening took place on April 30th, 1937. For over 100 years the residents of Street have been aware that their village is associated with the image of a reptilian skeleton (it is seen on the road signs as you enter Street and is used on Parish Council publications) but many do not know where the association comes from. Around 210 million years ago at the start of the Jurassic Period, Street was under a shallow subtropical sea. In the sea lived dolphin-like reptiles, called ichthyosaurs, which ate fish and squidlike belemnites. They gave birth to live young in the water. During the same time dinosaurs were living on land. When the ichthyosaurs died their bodies sometimes sank to the seabed where they were buried in the mud. Over millions of years the mud turned into Blue Lias limestone. Blue Lias was quarried in Street where it was used to build the walls of many houses. Blue Lias from Street was especially good for paving and kerbs so may be seen in many places over a wide area. It was during the 19th and 20th centuries that the fossil skeletons of ichthyosaurs were collected from the Blue Lias including many from quarries in Street. When Street Urban Council was created in 1894 it chose to use the ichthyosaur on its seal. Since local authority reorganisation in 1974, Street Parish Council has continued to use the ichthyosaur emblem. The ichthyosaur fossil from Streets blue lias stone can be viewed in the Natural History Museum in London. A copy of the fossil is in the museum in Bristol. Street twinned with Gravenchon on 26th March, 1967 and promised to maintain links between the 2 places in the interests of European unity. On 12th June, 1998 the pledge of friendship between Street and Isny was signed for the benefit of international peace and goodwill. Want to know more about Street?